It's never easy to find something that is durable for outdoor decoration. Sure there is always stone and marble but what if you need something that looks "softer"? My go to place to find such things is Formations on Melrose Avenue in Los Angeles. I love their outdoor garden area where I can find stuff that will soften up my client's outdoor space without any maintenance issues. 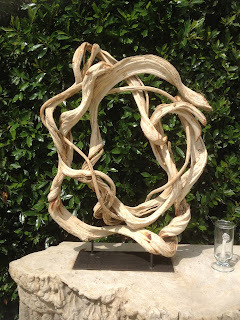 My client had a choice between a custom green wall or these driftwood sculptures. He picked driftwood sculptures because he's super busy and the last thing he wants to do is take care of plants! So for those of you who are green thumb challenged, these sculpture may be the next best thing!